MANILA, Philippines - TV personality Anne Curtis and her longtime boyfriend, Erwan Heussaff finally married in an intimate wedding in New Zealand on Sunday, November 12. It was star-studded with big celebrity names joining them in the memorable event. The wedding had been a hush-hush for days but such an event would be impossible to keep under wraps. Soon, photos of their guests, the scenic views of New Zealand, the wedding details and the couple themselves flood the social media. Their hashtag #TheWanForAnne was filled with photos from the event. On the big day, Anne was all glamorous and beautiful in her white Monique Lhuilier gown. Erwan who couldn’t contain his tears upon seeing his bride, was equally dashing. The wedding was rustic-inspired and was set in a beautiful garden. The IT Girls and the couple’s friends including Solenn Heussaff, Isabelle Daza, Georgina Wilson, Lauren Uy, BJ Pascual and many others attended. Anne’s It’s Showtime family was also there with Vice Ganda, Angel Locsin and Karylle. Anne’s “Man of Honor” was her best friend, Luis Manzano who came with girlfriend, Jessie Mendiola. Celebrity doctor, Vicki Belo also brought his family to the event. A day leading to the event, Erwan and Anne treated their guests to a bohemian-inspired wedding dinner. With the majestic views of the mountains of New Zealand, the guests were treated to a fabulous picnic. Anne looked very much the fashionista that she is, as she wore a chic Vera Wang dress. Erwan also looked dainty in his burgundy coat. It was their common friend, Isabelle Daza who played “matchmaker” between Anne and Erwan until they eventually became a couple in 2011. 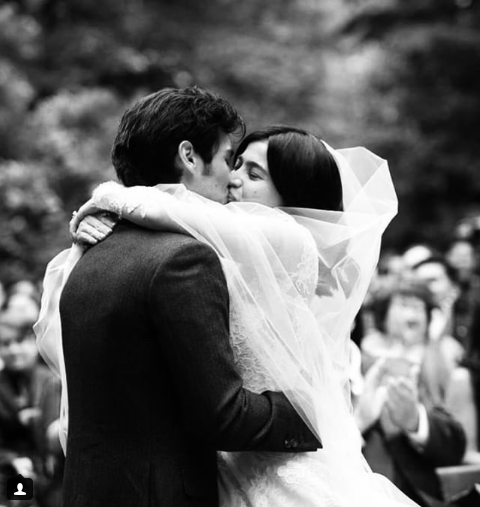 After six years of dating, Erwan popped the question and showed Anne a video he made outlining how and why he fell in love with her.